[prMac.com] Belo Horizonte, Brazil - Rainer Brockerhoff has announced an update to Quay, a system utility for Mac OS X 10.5 "Leopard". Quay extends the Dock's functionality, allowing the user to sort Stack menus in several useful ways, and see extra information for each item. Quay works transparently with the Dock and uses very few system resources. It follows aliases and symbolic links, and shows popup menus for Smart Folders. The user can restrict it to work only with certain Stacks, or fall back to the standard Dock menu/grid by holding down the Option key. * Allows icons on both sides of the Dock. 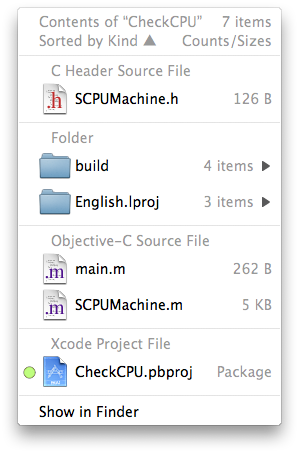 * Shows process information for running applications, version information for all application icons. * Can show 64x64 preview icons. * Full support for keyboard navigation in the Dock. * Full installer on the download disk image, uninstaller inside the application itself. * Command-key shortcut to open folder contents in the Finder. Quay is Euro 7 shareware. It will work indefinitely, for free, for the first folder/Quay icon on each side of the Dock; process information for all running applications is a free bonus. Rainer Brockerhoff has been programming since 1969, for the Mac since 1984. His RBSplitView open-source framework is used by nearly a hundred published applications, and several other shareware and freeware applications can be found on his website.